Like I said in the last post, the month of may was my exams, and then about a week ago I found out that I failed two of them, so I've been really rubbish at posting on this blog. But everything is almost over, I'm just about free for the summer, so I figured; lets do this! The last challenge frankly, was a cop out. Really rubbish, and I can't believe I even chose it! This time, it's something a little bit better; Chose a book for the month of July that is set in a completely fictional world. Examples of this type of book is: Any Raymond E. Feist book, Tolkien, Game of Thrones (though how closely it resembles the war of the roses is insane), Terry Pratchett's Disk World, Waylander/Druss the Legen by David Gemmell. There are so, so many more but none I can think of now. 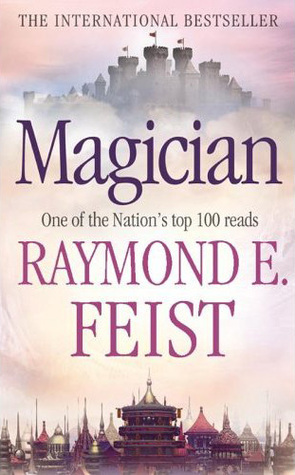 This month, I'm going to be reading Magician by Raymond E. Feist. I'm pretty sure I've got the version that is both parts of the Riftwar Saga, but I'm not 100% sure. My fiance has pestered me and pestered me to read it for years, and I'm finally doing it. Goodreads blurb: At Crydee, a frontier outpost in the tranquil Kingdom of the Isles, an orphan boy, Pug, is apprenticed to a master magician—and the destinies of two worlds are changed forever. Now I might be cheating a bit, because I am already like 100 pages in, and so far, it's awesome! Like, so much better than I thought it was going to be you can't believe it.